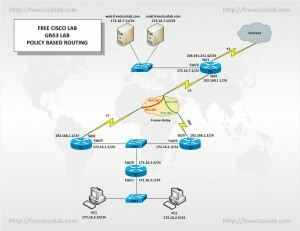 In this Free Cisco Lab we will use GNS3 to build a network scenario to help you understand and configure Policy Based Routing (PBR). This lab can be completed using real hardware but unfortunately due to the limited support for split horizons Cisco Packet Tracer cannot be used. Forwarding decision not based on the destination address—Policy routing enables the network engineer to define a path based on attributes of a packet, source/destination IP address, application port, and packet lengths, and to forward them according to a different policy. Policy routing can be configured to set the packet’s next hop or the packet’s default next hop/interface. Policy routing may also be used to route the packet to the null interface, essentially discarding them. Quality of service (QoS)—Route maps and PBR can provide QoS by enabling you to set the type of service (ToS) values and the IP precedence values in the IP header. QoS configuration is performed on the edge routers. This improves performance by preventing additional configuration on the core devices. Cost saving by using alternative paths—IP traffic can be manipulated with PBR, for instance, traffic such as large bulky batch file transfers can be sent over low-cost, low bandwidth links, whereas more time-sensitive, user-interactive traffic is sent over higher cost and higher-speed links. Multiple and unequal path load sharing based on traffic characteristics—Policy routing can be used to load balance traffic across multiple and unequal paths based on traffic characteristics versus the route cost. Configure Access Control List (ACL)s.
Configure Policy Based Routing (PBR) on the interface. Understand and configure Policy Based Routing.